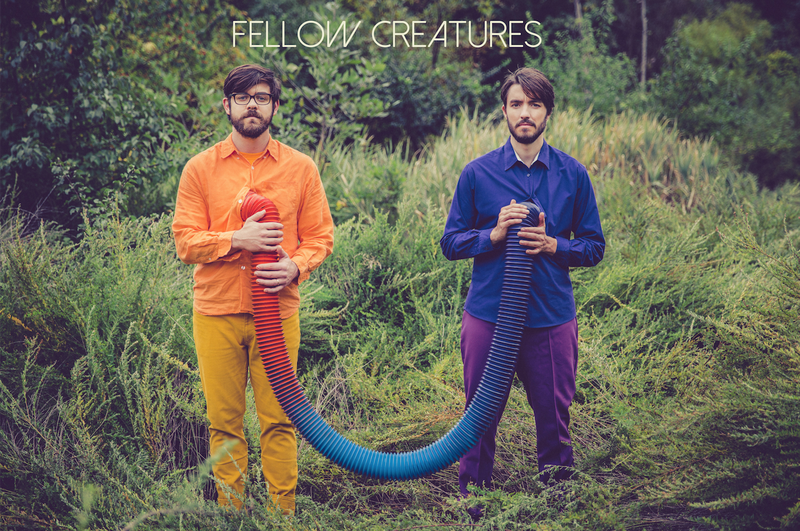 Let’s start with the band name, Fellow Creatures. It suggests solidarity amidst weirdos. What are you going with the name? Sam McCormally: As you can imagine, the band name deliberation process is extremely time consuming. I think we settled on it because there are some elements of our music that are a little obscure and potentially a little off-putting. Hardly anyone’s seen us play live at this point, but we do a lot of live vocal effects and we have some parts that are noisy and we also wanted to emphasize that there’s a part of our music that’s very accessible and dance-y and hook-laden. But all of the noisy, cacophonous off putting elements are really from our perspective in the service of creating a compelling live experience for people, and so we wanted to emphasize that pleasantness. Will McKindley-Ward: Yeah, the togetherness thing and the weirdness thing. I’m pretty sure I pulled it from Whitman somewhere, but I’m sure this is by no means the first or last time that those two words were strung together. Stylistically, is Fellow Creatures writing songs in the same vein as “Shuka Shuka”, this funky, polyrhythmic material? WM: Polyrhythmic yes, funky, maybe not. Sam called it dance-y earlier. WM: Well, maybe. Certainly relative to Ugly Purple Sweater. SM: And I think a lot of the elements such as the synths, processed vocals, the toy piano, the variety of guitar sounds: Those are all elements that are common to a lot of the songs. WM: But would Beyoncé call these songs dance-y? Maybe not. “Shuka Shuka” has an intriguing first lyric: “How’d ya find it? / How’d ya notice?” What did someone find? It’s quite the challenge. SM: I want to clear up any confusion about that demo: Those are not the real lyrics. WM: Nor is that the real name of the song. It’s a glimpse into our process, a little bit. A lot of the songs start with nonsense lyrics that end up taking shape and becoming something very real. SM: But now you’re making me want to keep that lyric! What prompted the big stylistic departure away from the indie folk you were doing in Ugly Purple Sweater? SM: There was an immediate cause, which was that two of our band members quit and that provided an opportunity to take a big a left turn. WM: It was a very organic process. We both were writing songs in the interim between the projects and we tried to find the intersection between what Sam was doing and what I was doing, and it just sort of happened to be at this place and then we went somewhere south of that and ended up with what we have now. SM: I also think that for me there was a thing that happened in music culture from the time that Ugly Purple Sweater started to when we ended and that was that indie folk went from meaning Joanna Newsom and Devandra Banhart to Mumford & Suns and The Lumineers and I think that as that trajectory progressed, the signifier of wielding an acoustic guitar on stage with your rock & roll band had changed a lot. That’s not to say that there aren’t great and artistic bands that are using banjos and acoustic guitars, but for me, the way I found those instruments intriguing and compelling was in bands like Grizzly Bear where they were ethereal and they hinted at almost classical or chamber music. By the time we were getting done with the project, it didn’t feel like that anymore. It felt like there was a more limited vocabulary in which those instruments were being used in popular music and I wanted to get away from that. That’s the external force for me, and then the more internal thing for me is that the only way to write new songs is to write in a different way: The only way to change artistically is to change your artistic process. SM: Well, I don’t play guitar in the band like I did in Ugly Purple Sweater, so that’s been a big part of it. Also, rather than starting with an acoustic guitar in my hand and strumming away, we both started by really recording demos; that was the composition process. We would find samples in weird, different pieces of music and loop them and then build songs from that, or I’d play drums badly and then try to find one 6 beat long sequence that was in time, loop that and build out from there. Part of it was just a way to try to get out of my habits and try to do something new without self-consciously trying to write like some other band. The other big thing is that in Ugly Purple Sweater, I was the primary songwriter and in this band we’re splitting songwriting duties and we’re getting up in each other’s business about the songs that we write. So a lot of the change has stemmed from Will’s influence. WM: Like Sam says, writing songs for the first time in a long time is a very different process. Also, I’m digging into the business end of things more and trying to help out and do a good job there. It’s important for me to not just be along for the ride, but instead to help shape the project is what it comes down to and that’s been a really awesome opportunity and I definitely can’t imagine doing that with anybody else right now. Sam’s just a great collaborator. He challenges me and I challenge him a little bit. Will, you’re writing for Fellow Creatures. Are you singing lead as well? SM: Yeah, we’re splitting lead duties. WM: I’m singing lyrics he wrote, he’s singing some lyrics I wrote. Writing lyrics together, that’s a goddamn trip, man. It’s so personal! Do you guys have any story songs, songs with explicit narrative? WM: Yeah. “Jubilee Stomp” chronicles the journey of the first creature to crawl out of the ocean and end up on the land and the reaction the creature has to this new place of newness. WM: It’s about an interesting moment, and the lyrics I write tend to be about capturing a very brief moment with a certain amount of detail. I find that interesting and fun. 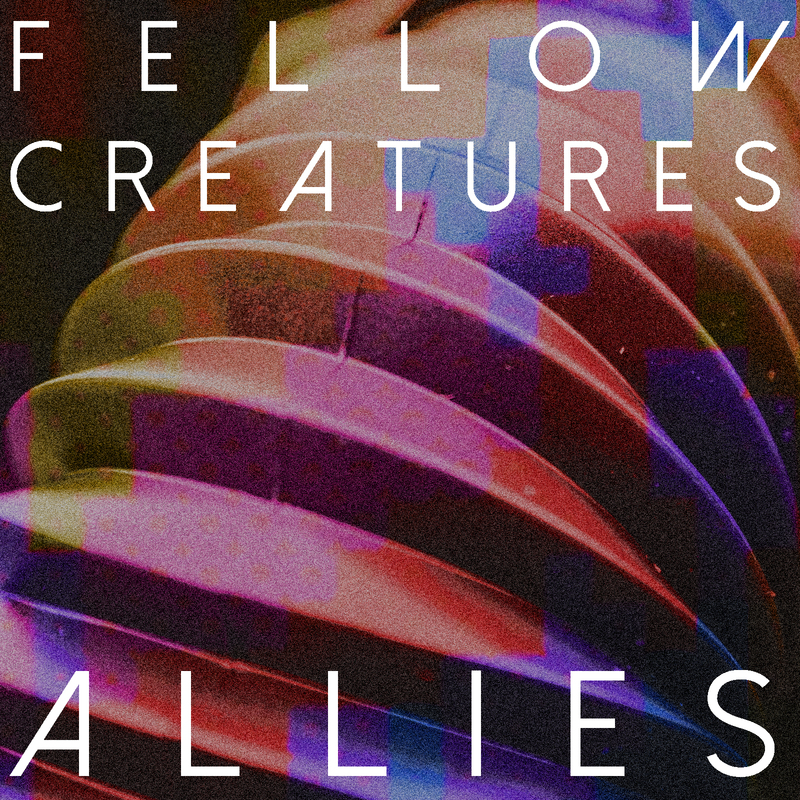 We’re premiering a hot-off-the-press Fellow Creatures song called “Allies”. What do you have to say about it? SM: It’s interesting to talk about our story songs because I think it’s one of the less narrative and it’s also one of the less “song-like” songs. Somehow it feels a little more abstract. WM: It’s not a pop song, or, it’s not very poppy. There are pop elements to it, but I don’t know. SM: It’s got a lot of auxiliary percussion, a lot of shakers and it’s based around a one measure loop from an Andrews Sisters song, and we run that live when we do it. That was one where I started playing drumming in my basement and I looped it and built the song up from that direction, which is sort of backwards from how I usually work. And the song is about believing people when they tell you things. WM: Sam, I’m glad that you went with that answer. That’s a good answer. What do you want to do with Fellow Creatures that you didn’t get to do with Ugly Purple Sweater? SM: I think the overarching thing for me is to just be a little more focused in terms of the sound, whereas the organizing principle behind Ugly Purple Sweater was “Here’s some songs I wrote!” and I think that from the perspective of a listener, it’s rewarding to hear somebody put together a set of songs that feel like they’re connected to one another, that really carve out a particular sonic niche. That is something we’re trying to do, we’re trying to make these songs hang together. WM: On the point of what we’re trying to do, one thing that Sam mentions a lot is the process of committing yourself with full knowledge that believing in what you’re doing can come across as egotistical and can feel uncomfortable but just doing it anyway in spite of that and committing to that because you love what you’re doing. That’s something that’s been a real guiding star for me, and it’s sort of new for me too, whereas in Ugly Purple Sweater, I felt very committed but I was I wasn’t involved in the direction we were taking. From a marketing standpoint, are you finding it challenging to start over with a new brand? SM: Just getting a different band name was pretty fun. It helps that our last brand was kind of ridiculous. With simply the name of Ugly Purple Sweater, there are moments where I find it charming and there are moments where I find it really stupid and I imagine that goes for other people as well. In some ways it feels good to get everything lined up. I think there was a tension between the songs we wrote first and the songs we wrote later and the name and the sound; those things didn’t always they lined up exactly the way I wanted them to, but this band has been us thinking about how to present one big thing and how we want to communicate to the world what we’re doing. I think to the degree that you are communicating to the world the frame of mind in which you’d like them to hear your music, I think it’s relevant and a good thing for bands to think about. But to the degree that Ugly Purple Sweater had some name recognition around DC, how hard is that going to be to recapture? Are people going to care? Are people going to show up? Are they going to be curious about the new thing? Who knows. WM: All we can do is just do what we’re doing and try to engage the people who are interested. SM: It is officially too early to say whether or not it’s working. We’ve talked a lot about what’s different in the new band, but what’s the same? With Rishi Chakrabarty (bass), you do have three of the same members from the last band. What’s carried over? SM: Will was saying that he felt like the songwriting was ending up being more similar than we had original thought it would be. WM: If you’re taking the view of the scope of all music, we’re not that far away from where we were. SM: I really like melody, and I feel like I’m always organizing songs around melody, maybe more than a lot of other songwriters, and I think that’s true even though we’ve tried to amp up the rhythm section and the polyrhythmic elements. They’re songs with melodies. I think that’s consistent with Ugly Purple Sweater. SM: We were just in the studio last weekend and we did two songs and we’re hoping to have one out the week of the show. Our hope is to release two or three songs and then drop the album. We don’t have a real firm timeline on that. What can we expect from Fellow Creatures in 2015? SM: We hope to put out a record eventually and tour on it. The other thing I’m excited about is that we’ve written the first album and we’re recording it and we’re starting to write the second album. 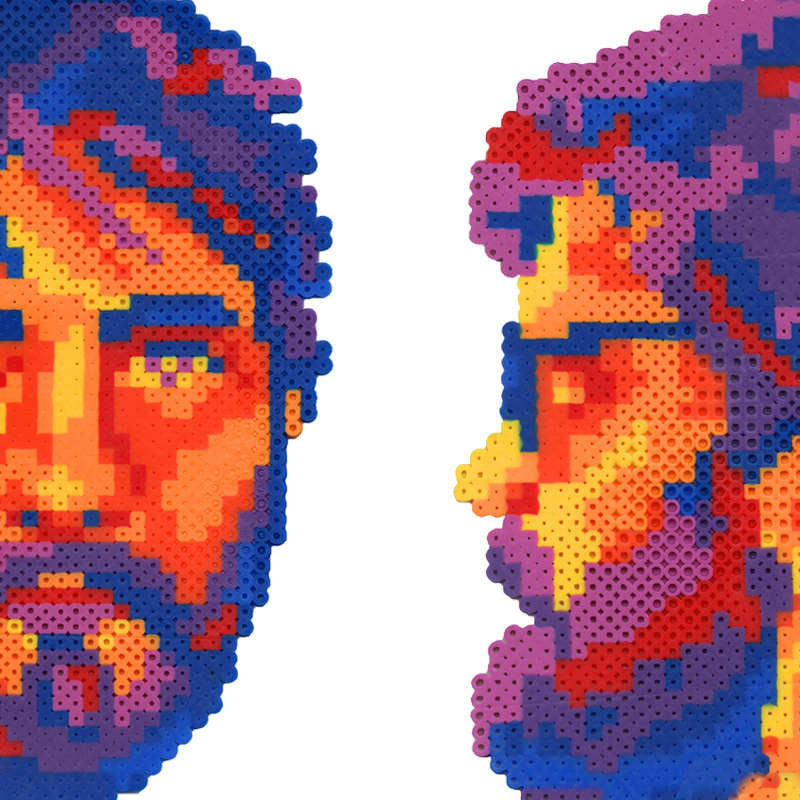 I was just always depressed in Ugly Purple Sweater because if I waited a year after an album was out to start thinking about the next record, it was going to be another year and half after that before the damn thing was done, so with Fellow Creatures, we’re all about just trying to keep the wheels turning all the time. WM: Yeah, there’s a lot of material. That has not been one of our weaknesses. I’m really excited to play with every awesome DC band. There’s so many great bands right now; DC’s doing a really good job right now and we just want to play with everybody. 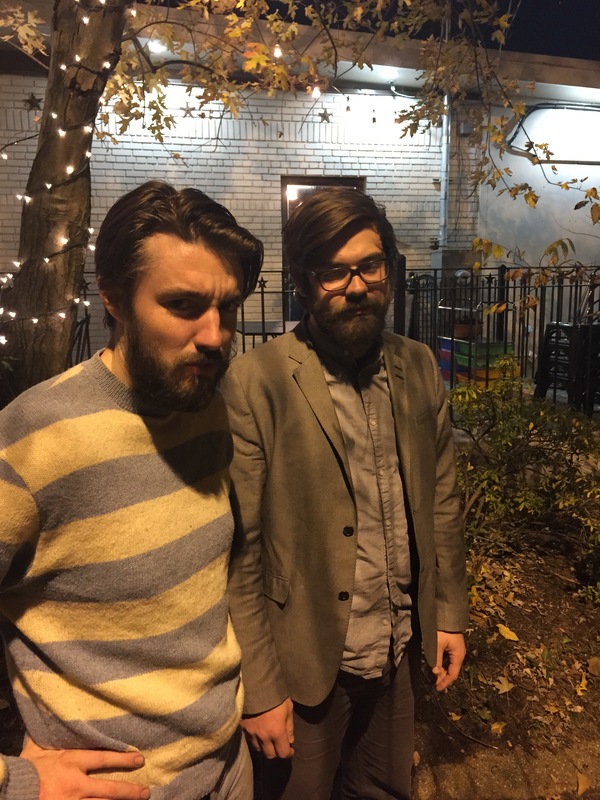 SM: We’re playing with Kingsley Flood on January 9th at Rock & Roll Hotel which we’re really excited about and the DC9 show on Saturday November 22nd. Just headlining a show at a proper venue feels like a coming out party of sorts.